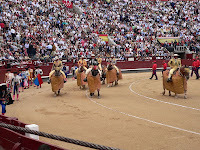 The Bullfight as a type of entertainment did not start in Spain. Many hundreds of years ago, Romans, Greeks and others from around the north eastern shores of the Mediterranean were watching men put there skills against wild animals as a source of amusement. Of course, we like to see ourselves as more civilized, and for the most part, society has banned such events. They are now relegated to disused warehouses where bloodthirsty gamblers bet on either a dog, cockerel, or whatever animal they can get to fight. There was a time when horse mounted Bull fighters were the only ones in the ring, but King Felippe V banned the aristocrats from taking part in such sports on the premise tha t it was just not right for people of breeding and culture. The common man could not afford a horse, which is why the Matador now fights the bull on foot. OK, back to the Bullfight. It works like this. The bull enters the ring and is baited, lanced and generally worn down a little by the Picadors. Then the Matadors underlings, the Toreros, further bait the bull, while the Matador gets a feel for the bull's general health and temper. 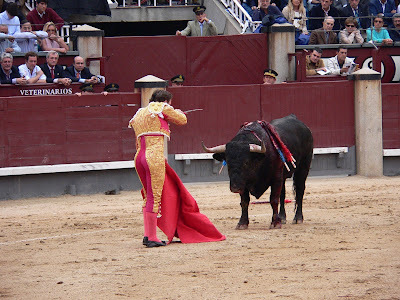 In the last few minutes, the Matador enters the arena, does some artistic moves, finally thrusting a sword in between the bulls shoulder blades. The bull dies. In the meantime, the audience has had great fun cheering on the brave men. Tourists from outside of Spain always appear to cheer the bull, a practice every bit as dangerous as being in the arena facing a bull. Copious amounts of sugar coated almonds are traditionally eaten by locals and tourists alike, and are sold in the same manner as ice cream in a movie theatre. Time for 'curtain up' on the final scene. Just one more thing. While you were buying leather products to take home from your vacation in Spain or Mexico, did you ever once wonder why there were so many stores selling leather stuff, and from where the leather originated? With 24,000 or so bulls appearing in Plaza de Toro's across Spain every year, there is a very good chance that a good few watched the bull die, from which your wallet, handbag or simple cigarette lighter pouch was made.